Brick Town Talk: Stay at the Valencia Hotel! 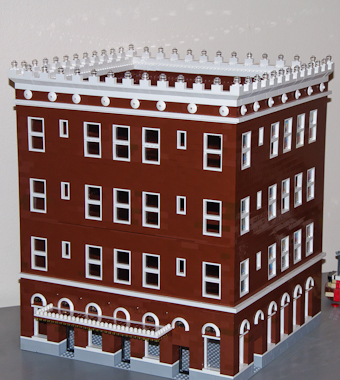 - LEGO Town, Architecture, Building Tips, Inspiration Ideas, and more! Stay at the Valencia Hotel! A spectacular rendition of the Valencia Hotel found in Anaheim, California. The thing that I like most about this structure is the turn of the century feel to it. The rows of repeating windows, cornice detailing, and the white clashing with the brown are just right for a building like this. Great job on this! I do too! I wish this building had an accompanying sidewalk though. "I've Got a Gal in Kalamazoo!" Now that's a rock wall!